At the 24 Hours of Le Mans, Toyota’s LMP1 squad is basically the Highlander—and we’re not talking about the truck. There can be only one...factory hybrid LMP1 team remaining in Le Mans’ fastest class. Thus, we’re not that surprised to see the No. 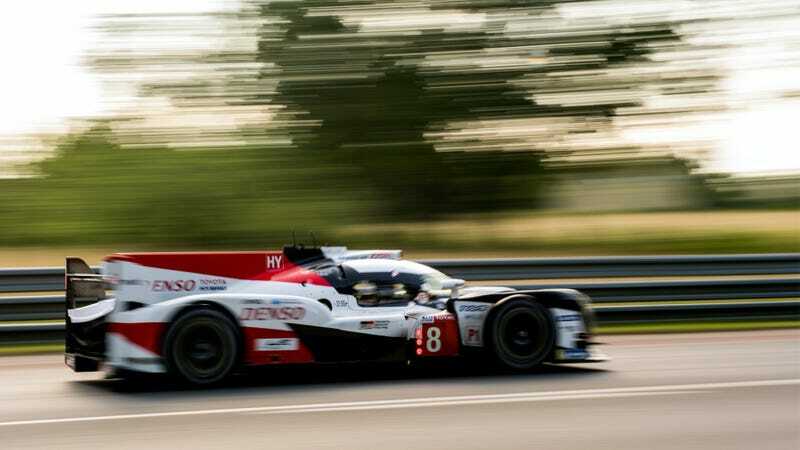 8 Toyota TS050 Hybrid set the fastest time in the first qualifying session today. Kazuki Nakajima set a lap time of 3:17:270 in the first ten minutes of tonight’s qualifying session in the No. 8, which remained untouchable until the very end. Thus, the No. 8—the car that has Formula One renaissance man Fernando Alonso in its driver lineup—has pole position for now, but there are two more qualifying sessions up tomorrow before the starting order is set. The next fastest car—again, to zero shock whatsoever—is the No. 7 Toyota TS050 Hybrid, which Kamui Kobayashi laid down a 3:17.337 lap time in. Here’s where LMP1 gets tricky: the next fastest car in the class, the non-hybrid No. 17 SMP Racing BR Engineering BR1 Gibson, was over two seconds off the Toyotas’ pace, coming in third in the class with a 3:19.483. Lap times were—in theory—supposed to even out between the hybrid and non-hybrid LMP1-class cars this year in order for them all to compete in the same LMP1 class instead of in two separate LMP1 categories as they were last year. Toyota needed competition! Add to this the fact that the Toyotas are expected to have a small advantage by being more efficient hybrid cars that won’t pit for fuel as often, and it’s their race to lose this year. Of course, the hybrids were much more fragile than their non-hybrid counterparts last year—so much so that a slower LMP2-class car almost won overall—so who knows what will happen in 24 hours of racing? Perhaps you’re more interested in how the other classes are doing, then. Porsche’s four-car onslaught on LM GTE Pro seemed to pay off today, with Gianmaria Bruni leading the class in the the Rothmans-liveried No. 91 Porsche 911 RSR with a 3:47.504, followed closely by the No. 92 Pink Pig-liveried Porsche 911 RSR. The Dempsey-Proton Racing Porsche 911 RSRs nabbed a 1-2 qualifying result in LM GTE Am, and the No. 48 Idec Sport Oreca 07 Gibson led the LMP2 class. You can view the full first qualifying session results here, and find out how to tune into Thursday’s practice sessions here. Qualifying 2 kicks off at 1:00 p.m. EDT, and the third and final qualifying session is at 4:00 p.m. EDT. Both qualifying sessions will be streamed on MotorTrend.com and the Motor Trend app in the United States and most of Canada.